Tom Cross' campaign for Illinois Treasurer continues to pick up momentum in the form on newspaper endorsements. First it was the 2nd largest paper in the Chicagoland area - The Daily Herald - endorsing him over his opponent Mike Frerichs. TWO ILLINOIS legislators and a third party candidate are vying for the office of state treasurer that will be vacated by incumbent Republican Dan Rutherford, who made an unsuccessful bid for governor. Former House Republican Leader Tom Cross and state Sen. Mike Frerichs have very different ideas about how to manage a constitutional office that primarily collects and invests state funds. Libertarian candidate Matthew Skopek has failed to mount any semblance of a campaign or make his plans known. Cross receives our endorsement, owing to his breadth of experience earned through more than two decades in the Illinois House and 10 years as minority leader, and his vision of how to add value to the treasurer's office for the citizens of Illinois. During a decade of Democrat control, Cross said he shared the frustration and embarrassment that many Illinoisans felt about the state's financial crisis, its backlog of unpaid bills and its worst-in-the-nation pension underfunding. ...Frerichs has been a member of the state Senate for eight years and was previously the Champaign County auditor. He wants to conduct an audit of the treasurer's office and put an end to "cronyism and corruption" among those he supervises. 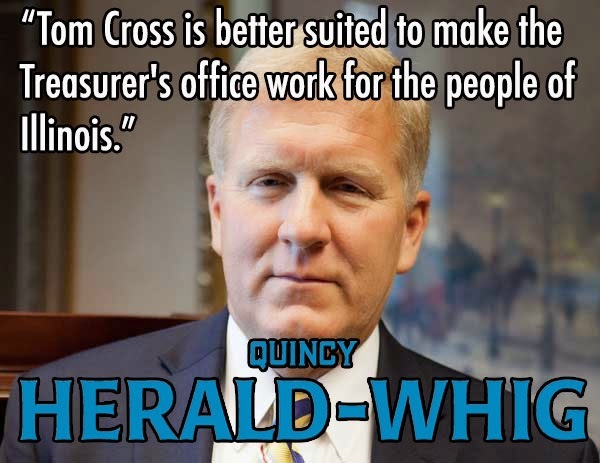 Cross is better suited to make the treasurer's office work for the people of Illinois. His long service as a counterweight to an overwhelming Democratic majority in the Legislature gives him the proper perspective on the importance of constitutional officers. His desire to see the state reform its finances is appropriate for the office of treasurer. Tom Cross is commended to voters for Illinois treasurer. That's 2 for 2 in terms of newspaper endorsements for Tom Cross. We're hoping his streak continues in the coming weeks.